Time to RSVP: Dinner Under the Stars! Join us for a delicious holiday dinner and an exquisite Sukkot experience, held in our big, friendly Sukkah, under the Starry Texas Sky! 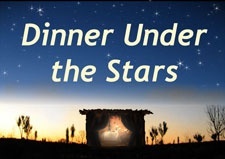 Dinner Under the Stars will be held on the first night of Sukkot, Wednesday, October 4, 8:00 pm. Suggested donation $26 adult, $10 child. Be a sponsor for $72 or higher. RSVP online . Make sure to checked your mailbox for this year's issue of the Bay Area Jewish Calendar! In order to fulfill this special Mitzvah one needs to ensure that the species used are the exact 4 species ordained by the Torah and are properly 'kosher'. We are pleased to offer you the opportunity to order good, reliably kosher sets, grown in Israel. Nice Kosher Set: $54 | Premium Quality Set: $75. 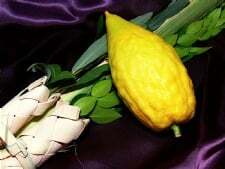 To order, please use our Event Reservation form and select 'Lulav & Etrog Order'. Deadline: Sept 26. Please place your order as soon as possible to guarantee availability. Join us for guided services that are lively, inspiring and inclusive. Hebrew-English prayer books provided. Kiddush refreshments after each Rosh Hashanah day-time service! See full holiday schedule under Upcoming Events. 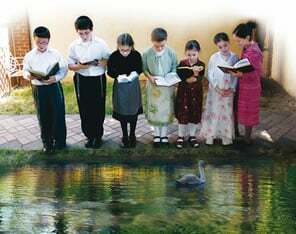 Join us on the first day of Rosh Hashana, Thursday, Sept. 21, for the beautiful custom of "Tashlich." Not yet reserved? We can still get you in for the Rosh Hashana Dinner! RSVP to join us for the delicious Community Rosh Hashana Dinner on Wednesday, Sept. 20, 2017. At Chabad Bay Area. Advance reservations are required. Make it personal, make it fun - invite your friends to join you! Reserve Free - High Holiday Services! Join us at the Chabad Bay Area - Center for Jewish Life & Learning for meaningful and joyful High Holiday Services! As always, there is NO CHARGE for services. When reserving you will have the option to make a contribution, your support, if possible, is most appreciated and helps make this and other quality programs available to everyone regardless of financial ability. - Highlights: Torah reading at around 11 am, Shofar at around 12 pm. Save the dates: Dinner Under the Stars & Simchat Torah! The ever popular Dinner Under the Stars will, G-d willing, once again be held on the first night of Sukkot, Wednesday evening, October 4th! Reservations will open next week. Dance with Torah Scrolls, Dine On Sushi Rolls! This joyous, fun and delicious Simchat Torah celebration will, G-d willing, be held Thursday evening, October 12! Save the date, because Simchat Torah at Chabad is something you just don't want to miss! This Friday, as we do the special mitzvah of lighting Shabbat candles (7:16 pm) let us all have a heartfelt prayer in mind for the welfare and welbeing of everyone in Florida. Free High Holiday Services - Make your reservation! Please see our website for the full High Holiday Services schedule. Come and join us for warm and welcoming, traditional, joyous and uplifting High Holiday Services! As always, services are free and open to everyone, no membership or affiliation necessary. Reservations are optional (but nevertheless helpful) and can be made free of charge. An optional donation, if you are able, is always appreciated and makes you our partner in providing meaningful around the year opportunities for Jewish life, learning and celebration!